Speaking of Research has the most comprehensive list of these policy statements, including institutions from ten different countries. For some countries we have only a few statements, often because language barriers have prevented us finding them – and for other countries we have many – particularly the US and UK. We have also rated these statements according to the amount of information they provide (see grading details). Nearly every UK Concodat signature has got a statement (some pharmaceuticals with research bases in the UK are classed as “International” in our lists). The University of Cambridge provides videos and other information on their website. In late February we announced that we had reached 200 statements. We are now at over 240 statements, and the list continues to grow. Please check if your institution is on our list. Below we should a table of the ratings in different countries. In some countries like Australia and Ireland there are only a few institutions which have statements, which are generally low rated. This is likely because there is no expectation among institutions to have such statements. On the other hand the US and UK have nearly 100 institutional statements each. 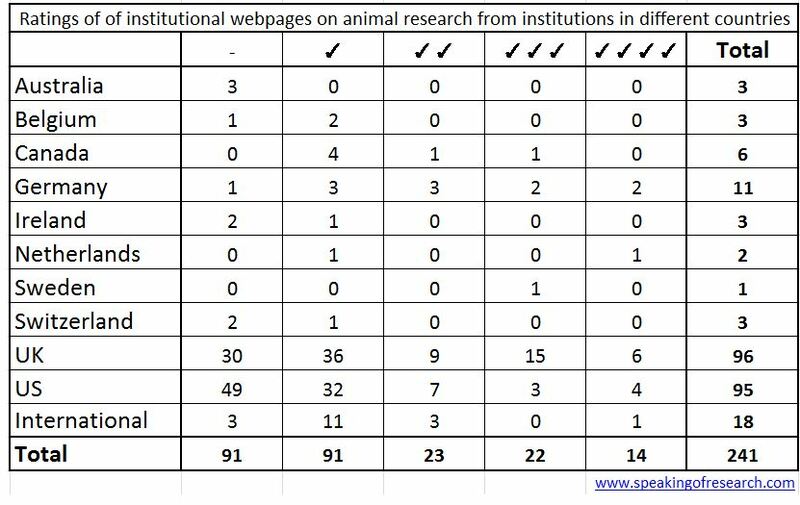 The UK is particularly impressive given that the 96 institutions represent (plus more in the International column) represents most of the biomedical research institutions conducting animal research in the country. What does a top rated animal research web page look like? Check out the fantastic work the University of Edinburgh has done on its website. If we compare the grading of websites in the UK compared with everywhere we find the UK provides more information on average. We can see that the UK has a higher proportion of statements ranked with 2 or more ticks. Two ticks would tend to mean a high level of website information available about an institution’s animal research. 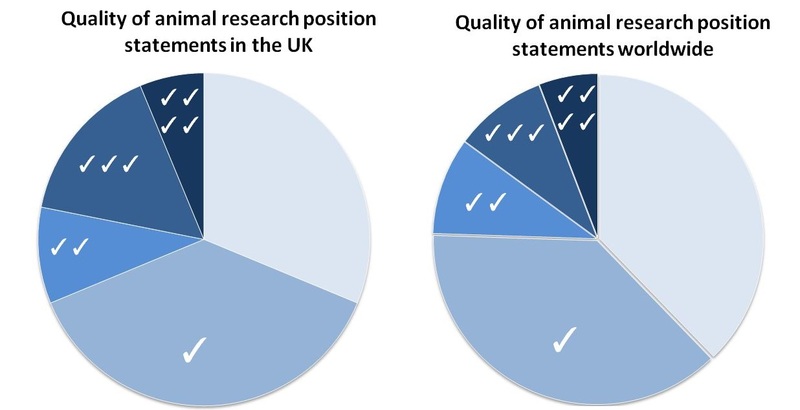 In our eyes the Concordat on Openness on Animal Research in the UK has had two main victories. 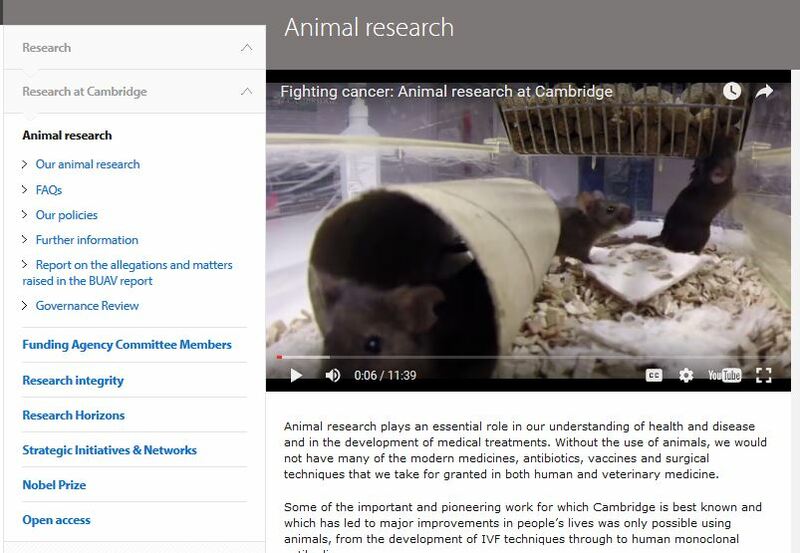 Firstly, it has encouraged nearly every animal research institution in the UK to openly explain on their websites that they do animal research – this is true of no other country. Secondly, it has helped drive better information to be provided on these websites, with increasing numbers of universities putting up case studies, images, videos and statistics. We congratulate the Concordat on Openness on Animals Research in the UK for supporting transparent discussion on this issue, and we wish it all the best as it enters its third year.